Nintendo may have won the first round, leading SouljaBoy to pull all of his previous SouljaGame systems from his online store, but that doesn’t mean SouljaBoy is defeated. Beyond all comprehension, he has returned with systems modeled after the Playstation Vita and PSP hardware. Let’s take a look, shall we? Both of these are called the SouljaGame Handheld. First, the one modeled after the Playstation Vita. Remarkably, this model is sold out at the $99.99 price point (apparently reduced from $200.) It is unmistakably modeled to look like the Playstation Vita, but what’s really under the hood, and how much does it really cost? According to the description, the package includes 1x MP5 Game Player. A quick Google search shows us what other places are selling this garbage for. The lowest I’ve found is on Aliexpress for $30. It appears to support a memory card up to 32GB and has 8GB of internal storage. Now, just because this appears to be a Playstation Vita shell doesn’t mean there’s anything illegal going on here. The key lies in the preloaded software. Does it come with any games? Considering these are sold out, and even if they weren’t I’m not going to give them my money, I will defer to Retro Core’s video review of the system. The video does show that it appears to come pre-loaded with Game Boy Advance games. The sneaky Sony camouflage isn’t going to be enough to get you off Nintendo’s radar, SouljaBoy. Did he think that the problem they had was with the visual similarity of the systems? Surely the other system they’re selling couldn’t be nearly as bad, could it? The other system, also called Souljagame Handheld–not to be confused with Souljagame Handheld–is very clearly modeled after Sony’s PSP. Looking into the description, we can see that it’s actually a knock-off called the PVP3000. Here, the SouljaInflation is a little less, as I was able to find the system for $13 on Aliexpress. Not much less than the $28.68 they’re asking for. Again, visual similarity isn’t enough to condemn the system, what comes preloaded? Well, just looking at the description, it doesn’t look good for the legality of the unit. It clearly states “Feature:Support 8bit FC games,64M memory,built-in 100 different games .888888 mix games.” FC in this instance clearly indicating Famicom. Further on in the specs we see that it also comes with a “888888 in 1 game card.” That’s a lot of games! I’ll be damned if SouljaBoy is getting a penny from me for selling these knock-off systems, so let’s see what Kaptain Klassic has to say about this system. Boy, a lot of those games look familiar. Just look at the box for this thing! Mario with a crash bandicoot logo.. I just.. I can’t.. I’m so.. This whole thing is mind-blowing. I have shorted a fuse in my brain. I just can’t. 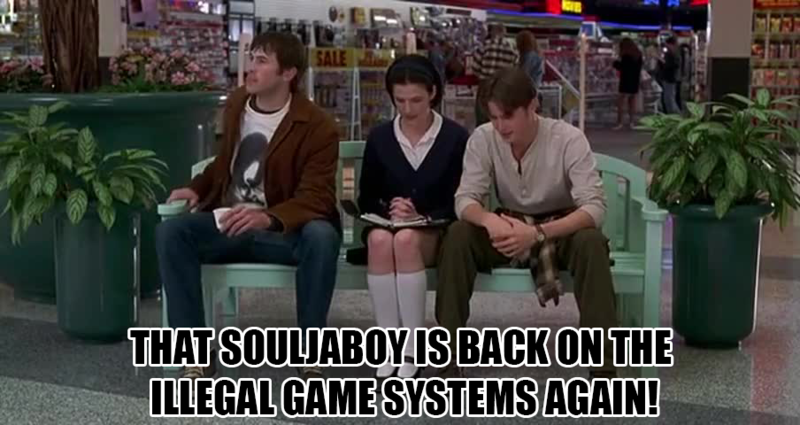 If SouljaBoy thought that this was going to save him from the apparent legal threats he received with the last batch of systems, I think he tackled the wrong problem. Pop some popcorn, get comfortable on the couch, this absolutely ridiculous saga isn’t ending any time soon, and we’re going to to continue covering it as it develops.